This Pro-Idee Concept-Store is part of the Pro-Idee company. Pro-Idee has specialised in locating quality products with a hint of the exceptional for 30 years now. Products that make life easier, less cluttered, safer – or quite simply more pleasant. We consistently uncover a stream of innovative new products and rare classics at over 50 trade fairs worldwide. Many of them are difficult to obtain in the UK – or indeed entirely unknown. Today, Pro-Idee is known for its deft hand at presenting superior products to discerning clients. They are superior to standard products in at least one of the following characteristics: Quality, function, originality, authenticity, exclusiveness, price and design. In this way, Pro-Idee provides brand manufacturers of global standing the same opportunity it affords smaller scale producers to introduce and popularise the best of their products. It is not uncommon that the most fascinating items come from small manufacturers who are based at home in secluded locations dotted around the world. This applies to precious clothing and even to many technical solutions. Everyone today is familiar with products that Pro-Idee championed on the marketplace: the Maglite torch by Mag Instruments, the Leatherman survival tool, the Corby trouser press, the Wurlitzer jukebox, Vornado fans, innumerable design products, fashion labels …. Over the last 30 years, increasing numbers of people have discovered how convenient it is to shop at Pro-Idee – in catalogues and web shops. They demand outstanding quality, and expect impeccable service. Our customers receive their chosen products with a long-term quality and price guarantee directly from our distribution centre in Aachen (Germany). The Pro-Idee Concept Store: New ideas from around the world. You will discover our most fascinating keepsakes from innumerable travels tucked away in the Pro-Idee Concept Store. After all, superb products from the worlds of technology & electronics, sport & games, and jewellery & beauty are often unknown here in our parts. Pro-Idee Cuisine: At home in your kitchen. Visit Pro-Idee Cuisine to find our best tips for ambitious hobby chefs, perfectly tailored to each important electric device, accessory or tool. Many of the pots, pans and knives are endorsed or co-developed by renowned top chefs. Fashion Classics: The true fashion classics. Modernised. Here in this shop you will discover the true classics of the fashion world, confidently withstanding all ephemeral trends. They stand as paragons of unshakeable quality, timeless design and superlative functionality … and oftentimes enjoy their own cult status. We would be delighted to send you a free copy of our latest catalogues. 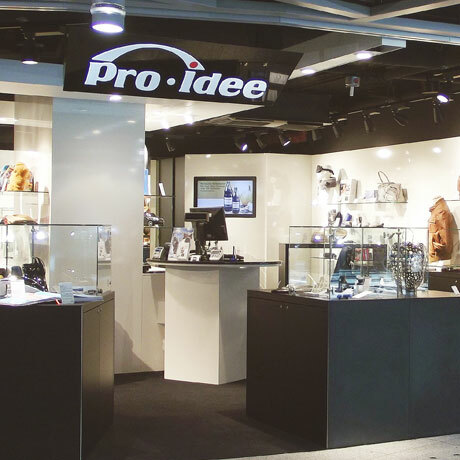 The 70 m² shop in Terminal B has the latest Pro-Idee Concept Store products, ideal gifts and novelties. Pro-Idee shop in Düsseldorf recipient of the „DUS Excellence Award”. The airport association Düsseldorf awarded its “DUS Excellence Award” for the very first time in 2015. Amongst all of the airport shops the Pro-Idee team was awarded the bronze medal. 2. if we cannot find anything better anywhere else in the world. Pro-Idee provides a guarantee that extends beyond the statutory warranty period of two years. The guarantee covers at least three years. You will find the details in the product descriptions. The Pro-Idee service ensures quick repairs at fair prices, procures spare parts and accessories, and even satisfies specific wishes after your guarantee expires. We will always offer a fair solution if the same product is available in the UK at a lower price within three months of your purchase. You will certainly be entitled in these cases to return the product at our cost and to request a full refund of the purchase price.